Being stuck for stuff with which to drown out the ticking of the clock, I decided to watch the third and fourth Crow films. I'm very fond of the original The Crow: it helped me write an essay on Hamlet when I was suffering from a nasty bout of scholar's block at university. Neither am I immune to the macabre twist that Brandon Lee died during the filming-- that always blows my mind. It's amazing that they were able to finish the film and to do it so well- no matter how many times I watch it, I've never been able to see the strings. The second film, City of Angels, was, by contrast, unmitigated crap. I was therefore less than hopeful for installments III and IV. First, I had to choose which one to watch first. Dan logic dictated to me that I should save whichever one was likely to be less awful for dessert. I checked the cast of each for helpful hints. Part III has Kirsten Dunst. Damn. On the other hand, it does have that redneck cop out of The Shield. We'll call that even. Part IV has... Edward Furlong. I think we have a winner. I stuck on IV and it was consummately bad. Edward Furlong versus the four horsemen of the apocalypse, incarnate in the form of a quartet of failed actors. Straight to DVD? Straight to Channel 5, I reckon. Additional marks deducted for hokey attempt at Native American spirituality. Having passed this stool, I was confident that III couldn't be as bad. The main character had shorter hair than usual, had been executed for murdering his girlfriend (which, of course, he hadn't) and busted out quite a few lines that wouldn't have been out of place in the original. It started brightly, got a bit silly, admittedly, and then the bad guys kidnapped Kirsten Dunst and sewed her damn mouth shut. I was a huge fan of this- I mean, it would have been so much more trouble to have whacked a bit of duct tape over her mouth, right? Even as I type, I have a hazy, guilty memory of telling a student long ago that the "duct" in "duct tape" is derived from the word "abduction." My word of the day: duration. Not because I'm particularly fond of its meaning, etymology or pronunciation, but simply because it allowed me to achieve my Holy Grail of Scrabble: getting a word over two triple-word scores and cashing out all my letters at the same time. There's only room for one Yokozuna in this house. It was one of those days when I was continually five minutes off the pace. I didn't start getting prepared for football early enough, when I looked for my boots they weren't there, I ended up having to play in tennis shoes and played like a right dolt. Got home, didn't have time to take a shower because tea needed cooking. Next thing you know, it's five minutes until I'm supposed to meet the dad at the social club and deodorant (shower in a can) is nowhere to be found. My eyes came to rest on the can of air freshener. I've done rougher things, but this is my worst in a little while. Pictures are available, but not much in the way of text, or meaningful text, at any rate. 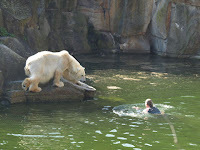 What is known is that the woman jumped into the polar bear enclosure at Berlin zoo, swam up to the bears, got mauled, then hauled to safety. The papers haven't managed to come up with any reason why the woman wanted to get so close to the bears. Was it an elaborate suicide bid? I consider the mum's suggestion, and the possibility of a clause existing in her life insurance, stating that death by polar bear will reap dividends for her next-of-kin. I suspect that fräulein will be in deep legal scheisse when she gets out of hospital: most probably people will be full of disingenuous complaints about how "traumatised" their children were by her antics (although kids are always secretly hoping to see someone get mauled when they go to the zoo, as am I). The zoo, meanwhile, should be seeking legal recourse for the fact that their polar bears have developed a taste for human flesh and the zookeepers can't go near them. Adam Curtis did a brilliant piece on Charlie Brooker's Newswipe on BBC4 last week about "Oh Dearism", the trend for television news to show shocking events about which we can do nothing but feel helpless and sad, and to which the only possible reaction is "Oh dear". I wonder if anybody in BBC Sport saw it. I only ask because Saturday's Football Focus and Match Of The Day used the 20th anniversary of the Hillsborough disaster to indulge in the kind of crass grief tourism that has become a media staple since Princess Diana's death. "A football match seems so unimportant in these situations," intoned a sombre Ray Stubbs on Match Of The Day. Had he followed his remark by saying, "So here instead is a short film," the cliché might have made some sense. But obviously we did not want to miss Torres's brilliant strike against Blackburn, or the seven-goal thriller at Stamford Bridge, so the show continued, but sans the theme tune at the end, and with the requisite Hillsborough chit chat between Alan Hansen and Mark Lawrenson after the Liverpool highlights. It was mawkish in some aspects, but you have to give Hansen his obviously sincere and heartfelt due. I found Alan Hansen's bit on Football Focus the most fulsome of the lot: artistic, looping camera pan round him in the cathedral before he delivers sententious punchline. I thought it was gratuitously over-engineered and lacking in humility. Most worthwhile comment came from Steve Claridge on final score, along the lines of "Yes, we got all-seater stadia, but we'd rather not have paid such a high price for them," which added a bit of perspective to the bon Motson on the subject. Additional kudos to Claridge for managing to fit a word in edgewise while Garth Crooks's big self-important mouth is flapping like a barn door in a gale. I was quite pleased with "bon Motson" (derived from a bon mot delivered by ubiquitous football commentator John Motson) although a search on Google informed me that I can't claim to be the inventor of the term. I was also happy to seize my opportunity to have a dig at Garth Crooks, a man who, I am confident, has never carried an argument by any means other than talking louder than everyone else. With bugger all else to do with my time other than sit around dividing my giro by fourteen in my head and playing Joe at Scrabble, I decided to pay a visit to the Education Show at the NEC in Birmingham. 1. Find new career and life direction. 2. Mump a few bags of stationery and other freebies. When I arrived at the NEC, there were all sorts of education types pushing round granny trolleys, having either stocked up on cutting-edge textbooks, CD ROMs and whatever else for their youthful charges at the various exhibiting stands, or (more probably) having mumped more stationery than you can shake a stick at. Series of check boxes. There's one marked Other. Home and dry. Not quite- a box flashes open. Son of a-- this is a witch hunt. I type in None of the above. The system gives up on questions and prints me out a badge that reads "Daniel McKeown - Charming." I skulk into the show, horizons and pockets wide open.